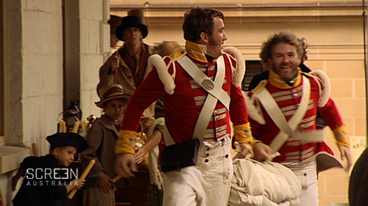 Video clip synopsis – Two soldiers in colonial NSW steal a piece of cloth, with the intention of getting caught. Broadband MP4 convictsteal_bb.mp4 (10.8MB), suitable for iPods and computer downloads. Two convicts steal a place in history is an excerpt from the documentary Rites of Passage the second episode of the two-part series entitled Rogue Nation, produced in 2009. Why do NSW soldiers Private Sudds and Private Thompson want to get caught when they steal a piece of cloth? What were their reasons? What are the differences between life as a soldier in the colony and life as a convict? How do you know? Look for evidence in what you can see and what you can hear in this clip. Why does Governor Darling want to make an example of these two? What difference does his intervention make to what happens to these men? What are the consequences of the iron chains for the convicts? How does Private Sudds become injured? What happens to him? Why do you think Governor Darling wants to make life tougher for convicts in the colony at this time? What is the role of Francis Forbes the first Chief Justice of NSW in this story? Does he agree with Governor Darling’s decision in this case? Why not? Why do the newspapers in the colony change from defending the Governor in this story to attacking him? What does Wentworth do to stir this issue up? Why do you think he might want to do this? What do you learn about life in the colony of NSW at this time from watching this clip? William Wentworth began a newspaper, The Australian (not associated with the current Australian newspaper) and published the first edition On 14 October 1824. Why do you think he did this? How does a newspaper help him in his quest for democracy and better rights for convicts and their children in the colony of NSW?